Affordable commercial property and good Internet are key reasons behind Newport being names Wales’ “top” city for starting a business in a recent study by Quality Formations. Despite Newport being ranked 28th overall out of 69 cities nationwide the study reinforces business’ reliance on good Internet access, which the Welsh Government are trying encourage with the expansion of their two broadband voucher schemes. ABC will now offer two levels of funding depending upon the Internet speed required. The first level will offer £400 for download speeds of 10Mbps+ and the second level will offer £800 for 30Mbps+. New connections through this scheme must deliver a step change in speed – with at least double your current download speeds (e.g. a current connection of 10Mbps must improve to at least 20Mbps). UCV is being opened up to businesses across Wales to help them meet the initial capital costs involved in installing ultrafast broadband services. The updated schemes are available immediately and are scheduled to run until March 2018. In May 2015 BT commissioned London based Regeneris Consulting to produce an updated assessment of BT’s contribution to the UK economy. Today (November 4th 2015) BT announced the findings of the Regeneris report, which makes healthy claims around job creation and regional suppliers. But what about the progress of the Superfast Broadband roll-out in Wales? 47% of targeted intervention areas could now access next generation broadband, but Wales still had the lowest levels of next generation broadband access of all the UK countries. The take-up of next generation broadband at these premises was 13 per cent. However, many of the more difficult-to-connect premises remain. With more public money being spent on Superfast Cymru Extension programmes, it’s yet to be seen how many people can actually access Superfast Broadband and how many are enjoying the service. Joe Garner CEO BT Openreach acknowledges that whilst people are impatient to get hold of Superfast Broadband there a parts of the country that BT will not reach. In conversation with Justin Webb on BBC Radio 4, Garner sticks to BT messaging whilst Webb challenges him on when and how Broadband is being deployed. Garner claims that Openreach publish on their website every individual property. We’d like to hear your experience if you can find your property and if you’ve been missed by Superfast Cymru. When challenged over BT’s coverage in cities, Garner stumbles over the question of BT’s preference to sell more expensive business products instead of more affordable services. Finally Garner admits that despite receiving substantial Government funding Openreach will fail to deliver services to hard to reach areas. Superfast Cymru targets to be met…? Superfast Cymru has past its half way mark but independent research indicates the Digital Divide in Wales is growing. Whilst we wait for the Welsh Audit Office to publish their overdue report into the value for money of the Superfast Cymru project, independent research by Think Broadband cast doubt on the capability of BT to deliver the Welsh Government Superfast Cymru targets. The Welsh Government state that “Superfast Cymru will mean that the majority of homes and businesses will be able to access broadband download speeds in excess of 30Mbps by 2016, with at least 40% of all the premises in the intervention area also benefitting from access to services in excess of 100Mbps. 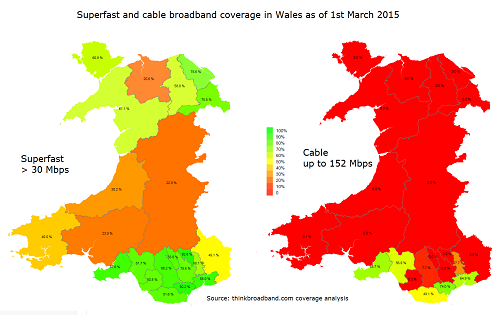 Think Broadband maps highlight growing gap between urban and rural Wales. Whilst these maps illustrate there is a job to be done in serving Rural Wales, the voices of those not capable of accessing Superfast Broadband remains muted. To see an overview of the Think Broadband findings click here. The Superfast Cymru Infil project has been launched to address the areas of Wales that will not be covered by Superfast Cymru following last years public consultation. The Welsh Government (WG) admits that its current Superfast Cymru contract with BT will not provide Superfast Broadband services to 100 % of premises in Wales by June 2016. WG’s new Invitation to Tender for interested providers predicts the contract length to be some 7 years (ie 2022). This could mean that people and businesses in rural counties such as Powys, may find themselves suffering at the end of the line for some time to come. Four out of five UK properties can now access superfast speeds, according to the UK Government’s announcement today. On the face of it the UK Governments BDUK scheme has certainly delivered the goods in terms of speeding up the process of getting fibre broadband to the UK fairly quickly, however the difference between having access to, and actually experiencing superfast broadband remains a contentious issue. The Welsh Government ‘aims to make fibre available to 96 per cent of premises in Wales by Spring 2016’. Some commentators suggest that this figure is likely to missed. Think Broadband estimate that 10.4% of properties (that is about 170,000) in Wales will not get Superfast Broadband (24Mbs). That said issue that needs to be highlighted and understood is that access to fibre doesn’t necessarily mean that end users will be able to enjoy the benefits of faster Broadband. The UK Government has long stated that it would like the UK to have the “fastest broadband of any major European country by 2015”. The Welsh Government states that it’s “committed to seeing Wales become a truly digital nation” and becoming “one of the most connected countries in the world by Spring 2016.” That said for many homes and businesses in Rural Wales accessing fast and reliable Broadband is still hit and miss affair. Whilst some still maybe struggling with poor internet access, the UK Regulator OFCOM have released their European Broadband Scorecard which shows the impressive improvement with the UK topping the charts in a number of categories. Whilst the progresss of Broadband deployments is positive news for Wales, the Broadband Scorecard will may prove uncomfortable reading for many in rural communities who already feel digitally disenfranchised and left behind in the digital slow lane. Travellers on Newport’s buses will soon b able to enjoy access to free WIFI. As part of Newport’s Super Connected City programme the Council has awarded a £840K contract to Icomera UK to deliver free WIFI on the city’s bus service. Newport Council successfully bid for £6m from the UK Government in December 2012 to attract and retain business and to provide greater access to superfast and ultrafast broadband for Small and Medium Sized Enterprises (SMEs). Funding has been allocated for two Newport projects: £2m for a WIFI Concession Model and £4m for SME Broadband Connection Voucher Scheme. Whilst take-up on the voucher scheme has been low the boundaries have been extended to include businesses in neighbouring Torfaen and Monmouthshire. The application deadline has also been extended from March 2015 to March 2016. In the meantime bus travellers will be able to enjoy free WIFI, although it remains unclear how spending almost £1M on the city’s bus service at this time will deliver the Councils goal of providing superfast and ultrafast broadband for SME’s. The new Ultrafast Connectivity Voucher from the Welsh Governement provides grant assistance of up to £10,000 for businesses in Enterprise and Local Growth Zones throughout Wales. The voucher provides assistance towards the capital costs of installing a broadband service capable of at least 100Mpbs. Welsh Government will provide 100% of funding on the first £3,000, then 50% between £3,001 and £17,000 and no further funding for costs of £17,001 and above. * Businesses within Cardiff Central Enterprise Zone are not currently eligible to apply for the Ultrafast Connectivity Voucher (i.e. already covered by the other Connection Voucher scheme). The Welsh Government (WG) are technology neutral when it comes to Broadband, however there is some confusion whether their Access Broadband Cymru (ABC) grant can be used to fund Satellite Broadband. Broadband users who receive less than 2mpbs can apply for the ABC grant as long as the money is spent on a Broadband solution that is ‘capable of’ providing consistent download speeds of at least 24Mbps. See WG website here. Whilst WG want to be seen to be deploying ‘Superfast Broadband’ of at least 24Mbps, Broadband providers operating via the KA Satellite can only currently stretch their offering to 22Mbps. We understand that some Satellite Broadband providers are willing to provide assurance that their service can deliver 24Mbps. However WG assert that they intend to put in place monitoring and control measures to check that providers are delivering customers with the service that they quote. Customers can obviously purchase a Satellite Broadband solution without grant support. For the foreseeable future at least, the WG ABC will not be funding such a solution (unless the provider is willing to put it writing that their service will deliver a stable service of at least 24Mbps).